Developed in white-coated laboratories and tested, and retested, on groomers and hardpack at screaming speeds, High-Performance boards with their GS DNA are for the most demanding skiers. Ride like the pros on these thoroughbreds. 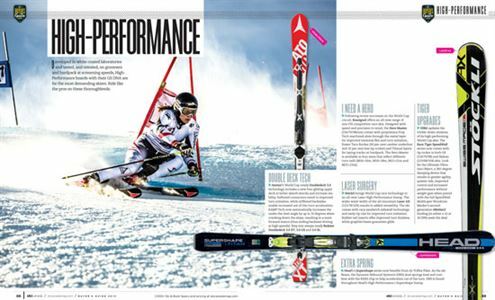 Stöckli brings World Cup race technology to an all-new Laser High-Performance lineup. The wider waist width of the all-mountain Laser AX (123/78/109) results in added versatility. The ski comes with racy sandwich sidewall technology and early-tip rise for improved turn initiation. Rubber tail inserts offer improved turn finishes, while graphite bases guarantee glide. Following recent successes on the World Cup circuit, Rossignol offers an all-new range of non-FIS competitive race skis. Designed with speed and precision in mind, the Hero Master (116/70/98mm)comes with proprietary Prop Tech machined slots through the metal layer for improved torsional flex and turn initiation, Power Turn Rocker (90 per cent camber underfoot and 10 per cent low-tip rocker) and Titanal layers for laying tracks on hardpack. The Hero Master is available in four sizes that reflect different turn radii (M16=16m, M18=18m, M21=21m and M23=23m). generation rMotion2 binding (in either a 12 or 16 DIN) seals the deal. Atomic’s World Cup-ready Doubledeck 3.0 technology includes a new free-gliding upper deck to better absorb shocks and increase stability. Softened connectors result in improved turn initiation, while stiffened backsides enable increased out-of-the-turn acceleration. RAMP Tech now automatically increases the under-the-heel angle by up to 10 degrees when cranking down the slope, resulting in a more forward stance (thus ending backseat driving at high speeds). Step into steeps-ready Redster Doubledeck 3.0 XT, 3.0 GS and 3.0 SL. Head’s i.Supershape series now benefits from its Triflex Plate. As the ski flexes, the Dynamic Rebound System’s (DRS) dual springs load and combine with the KERS chip to help acceleration out of the turn. DRS is found throughout Head’s High-Performance i.Supershape lineup.